Timez Attack (http://www.bigbrainz.com/index.php) is an educational or “meaningful” game designed to help children learn their times tables. It has an engaging and intuitive interface and players learn without realizing they are doing so. This product is really aimed at the K-12 sector and more specifically the K-7 portion of that sector. Having said that, it could easily be used in a remedial program in a high school setting. This is definitely a content type of offering. It is a pre-packaged “meaningful game” that can be used as either a stand alone or a school district wide application. This product really has several different types of buyers. An individual could buy a stand-alone copy for home use (as I did when my son was having a hard time learning his times table!). A district could purchase the software for installation on all its computers or a school could purchase it for the same application. It also might be possible for a clearing house such as EBSCO to buy this software and then be able to offer volume discounts to educational buyers that are members of its consortium. While there are a variety of buyers for this product I feel there are numerous markets for it, also. The first potential market is “wired Anglophone countries”. The product is American and all the language is American English. However, because there is a limited amount of actual language and the game is quite intuitive (even my 5 year old daughter was able to figure out what to do) I can see European and Asian countries as being other potential markets. Because it is a game with a need for a fairly good monitor and game card, it is somewhat limited to developed countries. Having said that, the home page advertises that their product is used in 200 countries. The product is available in English and Spanish at this point and I would imagine that, given a large enough demand, it could be translated to other languages fairly easily. Educational or meaningful gaming is on the rise and students who have high quality graphic games at home are not easily impressed with poorly designed games. I would think that the market supports a game like this only in relatively developed and wealthy countries and communities. While the game itself is not too expensive, you need a good computer to play it. This particular game was developed by an educator, giving him some “cred” in the market. His product is fun to play and unique and as such is, in my opinion, well positioned in the North American market place at the very least. Timez Attack is a game that would works well in a school setting, as extra reinforcement and practice for students who are learning the concepts taught. It would also work well in a home school setting. I do not think you would want to use it to replace the teacher, nor do I think the designer would desire such an outcome. Although we were not asked if we would invest in this company, I am certainly a satisfied customer and would invest if I had the opportunity! Thanks for this cube treatment of Timez Attack, Cari. I like that you mentioned home users for the purpose of helping to learn math. I think that this could be the most useful area for this type of product. For “Educational Integration,” it might be tough to use smoothly integrate into a lesson, since most elementary school classroom that I’ve been in don’t have any/many computers for students to use. It’s just that you’d be displacing your class to use this tool. I’m wondering if these types of games are going to be the next ‘big’ thing. The current generation has grown up with video games. I asked my Grade 5 class “Who owns a video game console?” EVERY hand went up. 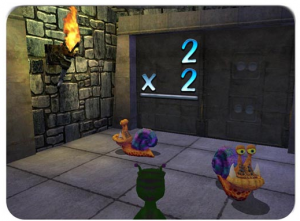 Timez Attack could be used by children with exceptionalities (aka special needs) who have a learning disability in mathematics (MLD). Certainly, this educational game would be beneficial to these students, for they are predominantly visual learners who require either an interactive (assistive) technology or math manipulatives, or both. Having the said students use Timez Attack during a computer block/period, for example, would be beneficial and fun, at the same time. I do think this could be used in a classroom setting, in several ways. You could install it on a single computer and have it as a work station or you could put it in the lab. While I agree that this would mean “displacing your whole class”, most school have their kids go to the computer lab once or twice a week. Why not make this game the focus of your trip while your class is learning or rehearsing their times tables?The great thing about this program is that it is child-specific. In other words, it will remember each child when they log in and will tailor the program for their needs, based on how they are progressing throuhg each level. I also think this would be a great program to have in the LAC room, to help with kids who are struggling. I just wish I could persuade my school to buy in! Wow, very cool tool, I had never heard of it, I can’t wait to check it out as my nephew is having difficulty with his times tables, but he definitely loves his video games!